Vanderbilt International must comply with the Data Protection principles set out in the relevant legislation. This Policy applies to all Personal Data collected, processed and stored by Vanderbilt International in relation to its service providers and clients in the course of its activities. The policy covers both personal and sensitive personal data held in relation to data subjects. The policy applies equally to personal data held in manual and automated form. All personal and sensitive Personal Data will be treated with equal care by Vanderbilt International. Both categories will be equally referred to as Personal Data in this policy, unless specifically stated otherwise. This policy should be read in conjunction with the associated Data Subject Access Request procedure, the Data Retention and Destruction Policy, the Data Retention Periods List and the Data Loss Notification procedure. In accordance with the GDPR, this data must be acquired and managed fairly. Not all staff members will be expected to be experts in Data Protection legislation. However, Vanderbilt International is committed to ensuring that its staff have sufficient awareness of the legislation in order to be able to anticipate and identify a Data Protection issue, should one arise. In such circumstances, staff must ensure that the Data Protection Officer is informed, in order to ensure that appropriate corrective action is taken. Due to the nature of the services provided by Vanderbilt International, there is a regular and active exchange of personal data between Vanderbilt International and its Data Subjects. In addition, Vanderbilt International exchanges personal data with Data Processors on the Data Subjects’ behalf. This is consistent with Vanderbilt International’s obligations under the terms of its contract with its Data Processors. This policy provides the guidelines for this exchange of information, as well as the procedure to follow in the event that a Vanderbilt International staff member is unsure whether such data can be disclosed. In general terms, the staff member should consult with the Data Protection Officer to seek clarification. Any formal, written request by a Data Subject for a copy of their personal data (a Data Subject Access Request) will be referred, as soon as possible, to the Data Protection Officer, and will be processed as soon as possible in accordance with GDPR regulations. It is intended that by complying with these guidelines, Vanderbilt International will adhere to best practice regarding the applicable Data Protection legislation. In the course of its role as Data Controller, Vanderbilt International engages a number of Data Processors to process Personal Data on its behalf. In each case, a formal, written contract is in place with the Processor, outlining their obligations in relation to the Personal Data, the specific purpose or purposes for which they are engaged, and the understanding that they will process the data in compliance with the GDPR legislation. The following key principles are enshrined in the GDPR legislation and are fundamental to the Vanderbilt International’s Data Protection policy. 1. ... be obtained and processed fairly and lawfully. Vanderbilt International will meet this obligation in the following way. The Data Subject’s data will not be disclosed to a third party other than to a party contracted to Vanderbilt International and operating on its behalf. 2. .... be obtained only for one or more specified, legitimate purposes. Vanderbilt International will obtain data for purposes which are specific, lawful and clearly stated. A Data Subject will have the right to question the purpose(s) for which Vanderbilt International holds their data, and Vanderbilt International will be able to clearly state that purpose or purposes. 3. ..... not be further processed in a manner incompatible with the specified purpose(s). Any use of the data by Vanderbilt International will be compatible with the purposes for which the data was acquired. 4. .... be kept safe and secure. Vanderbilt International will employ high standards of security in order to protect the personal data under its care. Appropriate security measures will be taken to protect against unauthorized access to, or alteration, destruction or disclosure of any personal data held by Vanderbilt International in its capacity as Data Controller. 5. ... be kept accurate, complete and up-to-date where necessary. conduct periodic reviews and audits to ensure that relevant data is kept accurate and up-to-date. Vanderbilt International conducts a review of sample data every six months to ensure accuracy; Staff contact details and details on next-of-kin are reviewed and updated every two years. 6. ... be adequate, relevant and not excessive in relation to the purpose(s) for which the data were collected and processed. Vanderbilt International will ensure that the data it processes in relation to Data Subjects are relevant to the purposes for which those data are collected. Data which are not relevant to such processing will not be acquired or maintained. 7. ... not be kept for longer than is necessary to satisfy the specified purpose(s). Vanderbilt International has identified an extensive matrix of data categories, with reference to the appropriate data retention period for each category. The matrix applies to data in both a manual and automated format. Once the respective retention period has elapsed, Vanderbilt International undertakes to destroy, erase or otherwise put this data beyond use. 8. ... be managed and stored in such a manner that, in the event, a Data Subject submits a valid Subject Access Request seeking a copy of their Personal Data, this data can be readily retrieved and provided to them. Vanderbilt International has implemented a Subject Access Request procedure by which to manage such requests in an efficient and timely manner, within the timelines stipulated in the legislation. As part of the day-to-day operation of the organisation, Vanderbilt International’s staff engage in active and regular exchanges of information with Data Subjects. Where a formal request is submitted by a Data Subject in relation to the data held by Vanderbilt International, such a request gives rise to access rights in favour of the Data Subject. There are specific timelines within which Vanderbilt International must respond to the Data Subject, depending on the nature and extent of the request. These are outlined in the Data Subject Access Request process. Vanderbilt International’s staff will ensure that, where necessary, such requests are forwarded to the Data Protection Officer in a timely manner, and they are processed as quickly and efficiently as possible, according to GDPR. As a Data Controller, Vanderbilt International ensures that any entity which processes Personal Data on its behalf (a Data Processor) does so in a manner compliant with the Data Protection legislation. Failure of a Data Processor to manage Vanderbilt International’s data in a compliant manner will be viewed as a breach of contract, and will be pursued through the courts. Failure of Vanderbilt International’s staff to process Personal Data in compliance with this policy may result in disciplinary proceedings. In addition, transactional information will be stored against each Cardholder and Audit information will be stored against service user. 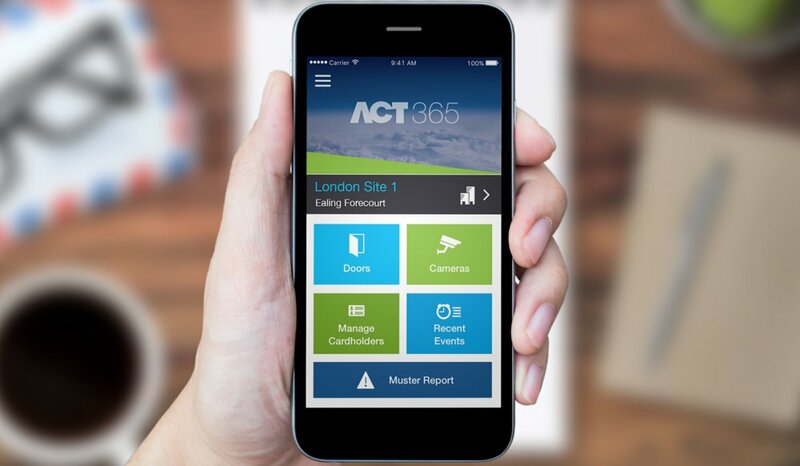 We use the information collected to provide a secure interface to your ACT365, your information is also used for your installation company in order to offer services and to support you. Where and how is my information stored? For users registered on act365.eu your information is stored on a database within the EU and will not be transferred outside the EU and for users registered on act365.net your information is stored on a database within the US and will not be transferred outside the US. Backups of the database happen regularly. Personal data is not replicated on any other system or used for any other purpose. The database access is strictly password protected. Only software engineers within Vanderbilt with the absolute need to access the database are allowed to do so. All access is strictly for management and control of the system, or for necessary debugging purposes. All information is saved for as long as the user leaves their account active on ACT365. The users account can delete at any time. Once they delete their account all user information is deleted. The database access is strictly password protected. Only software engineers within Vanderbilt with the absolute need to access the database are allowed to do so. All access is strictly for management and control of the system, or for necessary debugging purposes. ACT365 users enter data manually through the web interface. How can I manage, delete or rectify information about me? Data This includes both automated and manual data. Automated data means data held on computer, or stored with the intention that it is processed on a computer. Manual data means data that is processed as part of a relevant filing system, or which is stored with the intention that it forms part of a relevant filing system. Sensitive Personal Data A particular category of Personal data, relating to: Racial or Ethnic Origin, Political Opinions, Religious, Ideological or Philosophical beliefs, Trade Union membership, Information relating to mental or physical health, information in relation to one’s Sexual Orientation, information in relation to commission of a crime and information relating to conviction for a criminal offence. Data Controller A person or entity who, either alone or with others, controls the content and use of Personal Data by determining the purposes and means by which that Personal Data is processed. Data Subject A living individual who is the subject of the Personal Data, i.e. to whom the data relates either directly or indirectly. Data Processor A person or entity who processes Personal Data on behalf of a Data Controller on the basis of a formal, written contract, but who is not an employee of the Data Controller, processing such Data in the course of his/her employment. Relevant Filing System Any set of information in relation to living individuals which is not processed by means of equipment operating automatically (computers), and that is structured, either by reference to individuals, or by reference to criteria relating to individuals, in such a manner that specific information relating to an individual is readily retrievable.